The digital world has changed the way we achieve certain photography techniques such as multiple exposure. It can be easily achieved by a few in camera features, and with any photo editing program. In the early 2000's while just starting off in collage, I would spend hours in the darkroom or fiddling with my film camera attempting to get one multiple exposed photograph that was not muddy, and held some point of interest. I would usually come up with an image that was alright but I would often feel drained and discouraged from my lack of skills. Other students seemed to naturally breeze through this technique, while I struggle. I admired their success. Years later with digital photography, a painful process (or fun depending on your perspective) can turn into an enjoyable one. What used to take a long time to make one photograph has turned into making many in just a short time. Practice is still needed to get desirable results, but the process of learning what works and does not work is sped up. Multiple exposure photography is a creative outlet that I have never really had the change to enjoy. I struggled with it in the beginning and found my niche with macro photography and I did not bother with attempting multiple exposure again. I never considered combining both of them before and I have always been happy with with my macro photographs. I admired photographers who excelled at this technique, and deep down envied their success. Multiple exposure has always been something I wanted to try again, but part of me feared the struggles I had in the past. When my Digital SLR Photography September magazine arrive, I decided to give this technique a second try. 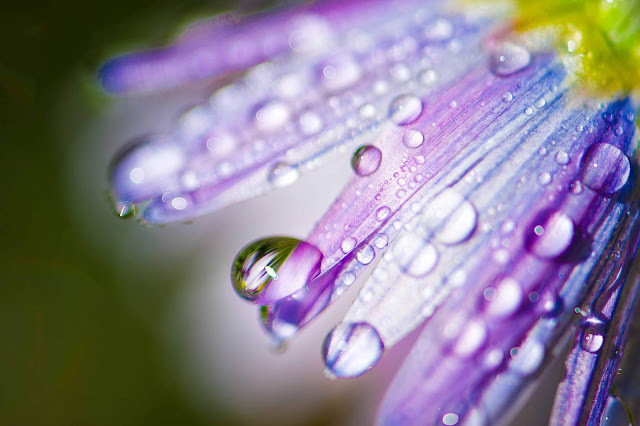 In this issue, Jordan Butters wrote an article in the photo skills section, called "Hazy Blooms." He wrote how to create beautiful flower photographs using the in camera multiple exposure techniques. 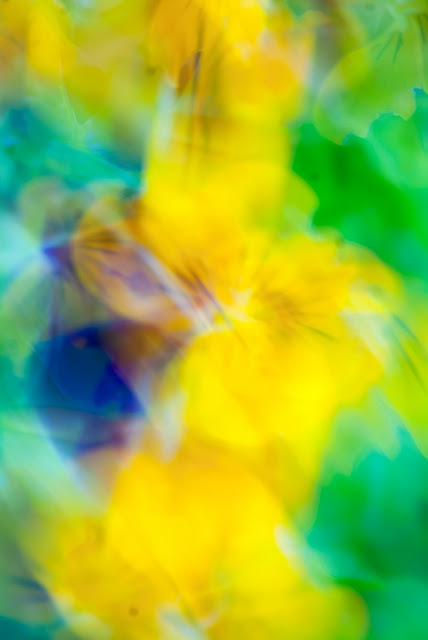 The photographs looks like beautiful impressionist flowers. This type of style is what I am working on with my Abstract Landscapes series, but instead of using multiple exposures, I use a Lensbaby lens to abstract the photographs. 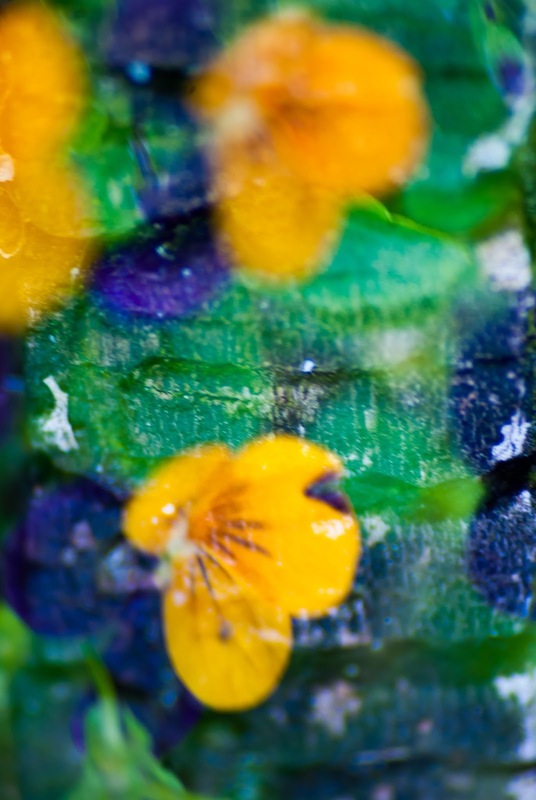 The process seemed less intimidating than the darkroom days, and it had sparked my interest creating impressionist macro flower photographs. Butter's article was fairly simple to follow and I was able to create some interesting photographs. I used two in camera techniques, Multiple Exposure function and Image Overlay function. Depending on the type of camera you have will depend on what your functions are called and how much variety of options you have, you might have to refer to your owners manual. 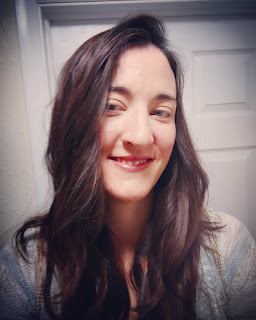 Most DSLR cameras do have an in camera setting for these, but if you find that you do not have these options you can always do this technique in a photo editing program. If you are like me and have little experience with multiple exposure, I encourage you to use settings and lenses that you are already familiar with. This will reduce any problems or frustrations while you are perfecting the process. I used my Nikon DSLR and started off with my 70-300 mm lens. I chose this lens because I wanted the focal length to have versatility. This lens is excellent at getting macro images and shots from a distance. Later after feeling more confident in my skills I branch out to my Lensbaby to see what kind creative effects I could add on top of this technique. I prefer a lower ISO, keeping it at 200 and varying it depending on the lighting. I did not use a flash or tripod, however, if these items are in normal setup or your subjects might benefit from it, I encourage using them. Usually with macro photography, I use natural light and hand hold my camera. Since flowers are the subject, I went ahead with my normal routine. I shot in raw, and aperture priority because I wanted more control over the final image and create a Bokeh effect. The multiple exposure function is location in the shooting menu. Once I have selected this option, I can choose between 2-10 exposures. I left the auto gain on. The auto gain helps your camera compensate the exposure by reducing it depending on the amount of exposures you are combining. Once everything was set, I did my first photograph. The image above was taken with four exposures. All the images are of flowers. I was very pleased with the results and colors. Even though I thought the photograph was beautiful, I wanted my imagines to have more defined lines and shapes. With this image I decided to go in the opposite direction. I wanted to see more defined lines and shapes and not be distracted by color. I switched my camera to black and white, and changed the subject matter. I also used two exposures instead and photographed my Boston Terrier and our house gutter. The results were just what I was looking for, strong lines and textures. There is a bit of mystery to the photograph. This photograph reminds me of the Spiritualism movement in the 1800s. It has a ghostly vibe. Discovering what creates the lines that I like, I switched my camera back to color and bumped up the exposure to four images again. I wanted to create a photograph that would look like a refection. I used my knowledge of strong line and my love for flowers and took pictures of some bricks, flowers, trees and a metal bird feeder. With my only goal being to create a reflection I think I was successful. The trees created depth and the bricks and bird feeder created texture. 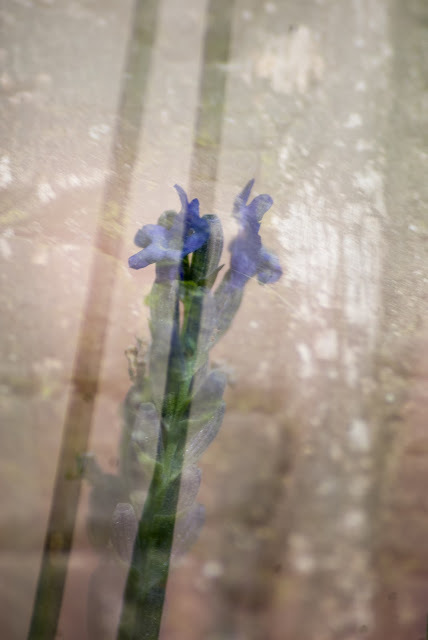 The image of the flower and trees made the photograph seem like it had two sides to the reflection. I am amazed how combing random objects can make such a poetic photograph. Next I wanted to create a photograph that did not look like a multiple exposure from a distance. I liked the texture and line I created with the first images that I attempted to use these to my advantage for next photograph. 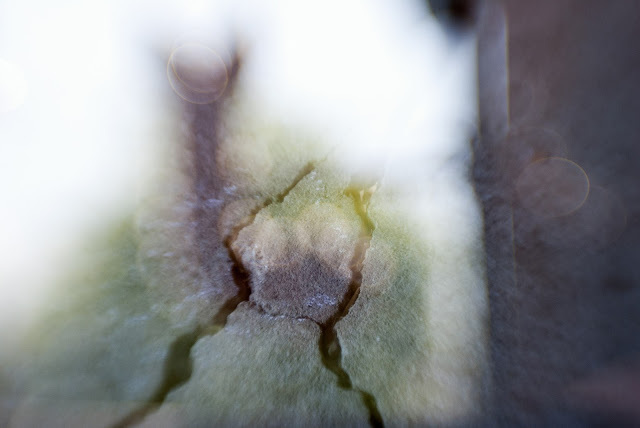 I changed my exposure to 2 images, of peeling paint on wood and flowers from my garden. I figured the wood would give me the texture I wanted and I picked flowers that were bold and vibrant. I loved the results. The only down side to in camera multiple exposure is that I had to take the photographs back to back. This require a bit more planning but I am satisfied with the results. I found that textured items, solid items and items with refine lines usually worked best with organic subject. They seems to contrast each other and give the image depth and texture. I think for a first time experiment the results were desirable. I can not wait to play with it more and see what else I can create. Next I switched my camera to the Image Overlay function. This is located in the shooting menu next to the Multiple Exposure function. With this feature I can select up to two images to combine. This is a great function, because I can take any photograph on my memory card and overlay them on top of each other. Instead of having an auto gain option, I can adjust the exposure for each image myself, and it will not affect the original image. I left each image a 50% opacity until I felt more comfortable with the function. Depending on the camera you are using, you may have more choices for the amount of photographs you can overlay. 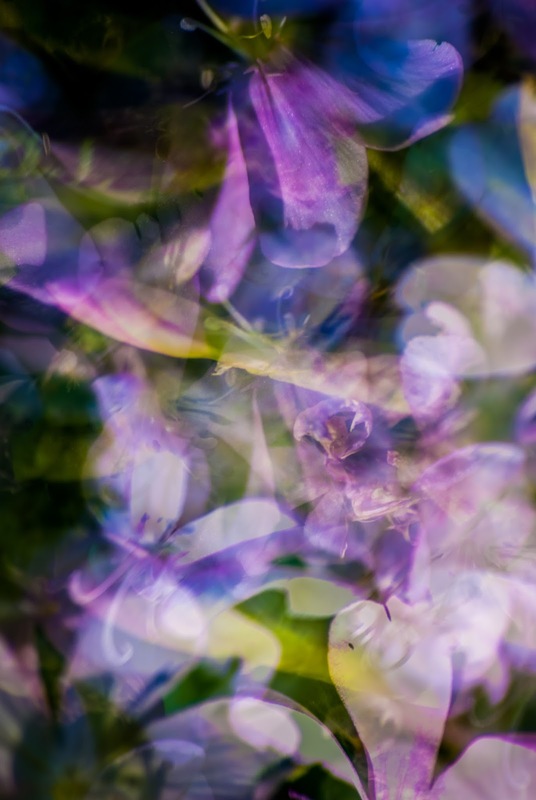 I used my Lensbaby with this series of photographs because I wanted to see what the lens distortion did when overlaid with other images. 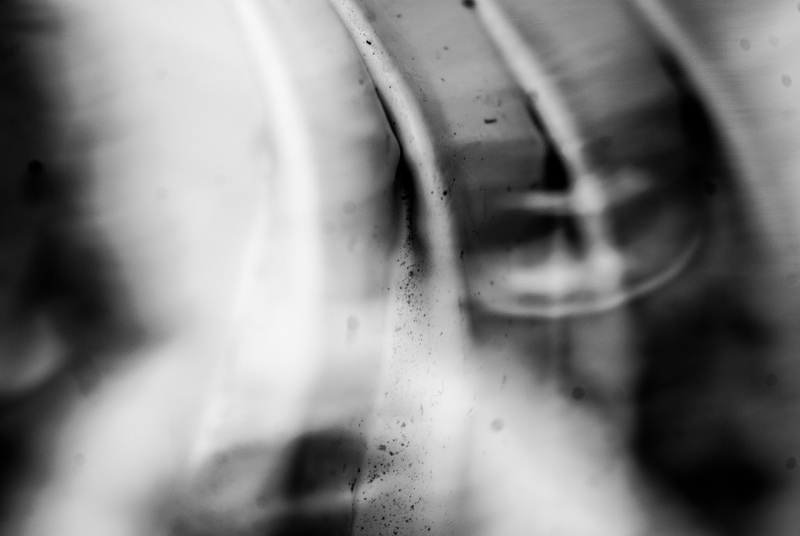 I already love the abstraction that I am able to achieve with the Lensbaby by itself and with the success after the first round of photographs, I decided to give it go. I was not disappointed with the experiment. This photograph is a great example of why I like the overlay process. The first image is a blurry image I took a month earlier in downtown Denver of a bar sign, the second image is of a crack in cement. This image is not the most exciting, but I love how the cement seems to be reflecting the building, like the cement is a window on a sunny day. This photograph is of grass that has gone to seed. The grass was so beautiful with all of its colors, lines and tiny individual seeds. 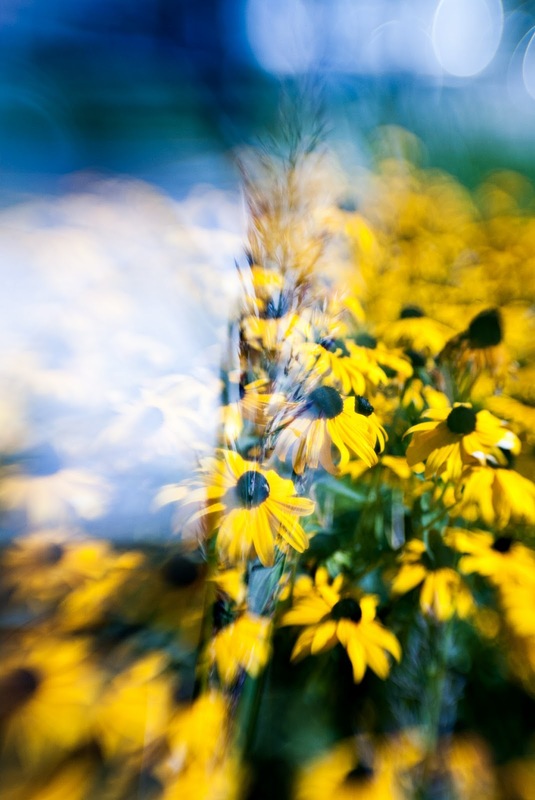 The second image is of a field of Black Eyed Susan's. I combined this out of just love for each item I photographed but also I kept in mind that there are some strong lines and colors in each image that they would compliment each other well. I am in love with the results, the image looks like a window reflecting on beautiful day. 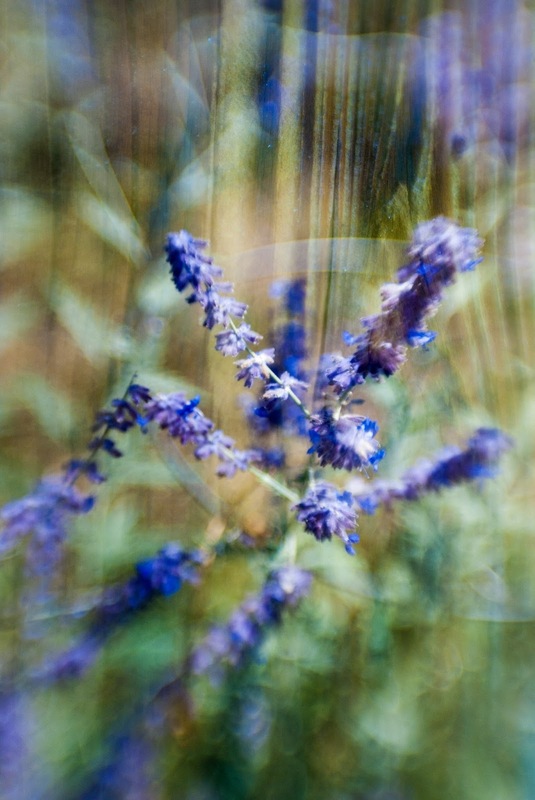 In the photograph above, I combined a close up of wood grain and a lavender plant with a large amount of Bokeh. I love the layering and texture of this image. The lavender appears to be jumping out of the wood. I really enjoyed trying multiple exposure again and learned a lot. Overall I enjoyed both function and think they both have some good pros and cons. I plan on exploring this technique more and seeing what kind of images I can create.